We’d love your help. Let us know what’s wrong with this preview of Designated Infected by Ricky Cooper. 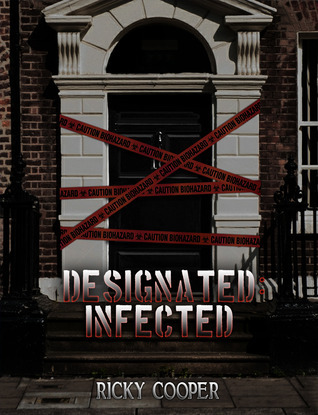 To ask other readers questions about Designated Infected, please sign up. This book was so outside my comfortzone, but I must admit it is incredibly well written. The special operations team that deals with the 'Designated Infected' is a close nit group of men. Who at times they are hilarious in the face of what they deal with, taking out these infected while trying to remain uninfected themselves. The details in which this is written, clearly give you a visual of what this operations team goes through and deals with in very vivid detail. The book moves nicely and you This book was so outside my comfortzone, but I must admit it is incredibly well written. The special operations team that deals with the 'Designated Infected' is a close nit group of men. Who at times they are hilarious in the face of what they deal with, taking out these infected while trying to remain uninfected themselves. The details in which this is written, clearly give you a visual of what this operations team goes through and deals with in very vivid detail. The book moves nicely and your swept along trying to figure out what, for lack of better analogy, boot will fall next. I know it took me forever, it feels like it did anyway, to finish this book. But I just needed to take breaks because I just normally don't read this type of thriller/end of days/zombie-ish/graphic/but hilarious at times book. I guess if you can't beat 'em, laugh with 'em, or at them....LMAO!! Not sure if I will read book two...fortunately my stomach and brain have a little time before the next release. A Zinger of a Zombie Apocalypse at it's finest! The author did a superb job of extending my reading genre. The vivid images his writing style brought to my mind had me cowering in fright in the dark of night. I clearly heard every haunting moan, scream and groan these 'creatures' emitted throughout the story. The gore was extreme, the blood, guts, grime and military scenes were sick, gross and absolutely intense. This story had me locking my doors, securing my windows, shutting my closet door ti A Zinger of a Zombie Apocalypse at it's finest! The author did a superb job of extending my reading genre. The vivid images his writing style brought to my mind had me cowering in fright in the dark of night. I clearly heard every haunting moan, scream and groan these 'creatures' emitted throughout the story. The gore was extreme, the blood, guts, grime and military scenes were sick, gross and absolutely intense. This story had me locking my doors, securing my windows, shutting my closet door tight and looking under the bed before closing my eyes. I loved every jaw dropping word he wrote. Baker is definitely my new BBF, this heroic soldier is completely honorable, fearless, and unstoppable. I love how he shows his feelings in the battle to contain this atrocious infected strain and with every loss he endures of his fallen comrades. I enjoyed reading about Baker's team and each of their characters and attributes. I'm eagerly awaiting the return of my 'Cherry' and all his charms! This is book one of the Designated series by first time author Ricky Cooper, and I must admit he's made a very good job of it for a first release. A devastating plague is raging across the planet turning it's victims into flesh craving monsters. In England an elite team code name Broadhead, lead by Derek Baker, travel the globe in an attempt to find a cure and deal with outbreaks of the infected within the British isles. The action is fast, bloody and very graphic in it's description especially e This is book one of the Designated series by first time author Ricky Cooper, and I must admit he's made a very good job of it for a first release. For someone into war and games this would probably be rated a 5. I was looking for more of a medical story and less of the actual slaughter that took place in the majority of the book. In my estimation less than 27% of the book dealt with plot and actual story, but I'm sure that there is an audience for this genre. Definitely went outside my comfort zone to read this book, but I wasn't disappointed! Ricky Cooper, is a writer with a love affair of the written word. He is an avid shooter and outdoors man and loves art and sculpture. He can often be found "when not Writing" spending his time designing and sculpting his own figures and models or designing equipment and characters for his books, a fervent supporter of LGBT rights and Equal rights for all. He spent most of his young adult life alongs Ricky Cooper, is a writer with a love affair of the written word. He can often be found "when not Writing" spending his time designing and sculpting his own figures and models or designing equipment and characters for his books, a fervent supporter of LGBT rights and Equal rights for all. He spent most of his young adult life alongside his family working for a UK based HIV and Aids charity, where he spent time aiding people suffering from the often deadly afflictions brought on by the disease. He lives with his family in West Wales in the UK.